Home › Home and Kitchen › Fresher Food Airtight Lid Beautiful Glass Container Jars - Protects Your Food.. Fresher Food Airtight Lid Beautiful Glass Container Jars - Protects Your Food..
AIRTIGHT SEAL FOR LONGER STORAGE TIMES. Foods stay fresh and delicious with your new Glass Jars. Ideal for all sorts of foods such as rice, beans, dried fruit, pretzels, chips, peanuts, pasta, cookies, candies, coffee etc. These kitchen storage glass containers come in a set of two: a large jar and a smaller one. STYLISH DESIGN AND WILL LOOK AMAZING ON YOUR COUNTERS. This stunning glass container set will take the spotlight in your kitchen with their capsule shaped, sleek look. They are stunning yet very powerful, both shatter resistant and spill-proof. A GREAT CHRISTMAS GIFT or stocking stuffer, perfect for wedding gifts, birthdays or any other occasion. The glass food container jars come in a nicely packaged box ideal for wrapping up a great present. 100% SCENT PROOF, LOCKS FRESHNESS IN & ODORS OUT. Foods stay fresher for longer periods of time with your glass containers with lids. Cut down on waste. Stop throwing out good food! BPA-FREE, PVC-FREE, PHTHALATE-FREE. Hygienic soda lime glass body is capsule shaped so that it requires minimal space on the countertop. They make great decorative glass containers. PERFECT FOR REFRIGERATOR AND FREEZER STORAGE. Store foods in the fridge and then heat them in the microwave using the same container jar. They're DISHWASHER SAFE and ENVIRONMENTALLY FRIENDLY. The snug fitting plastic lid also works as a MEASURING DEVICE AND OFFERS ANGLED MEASUREMENT for easy reading. Welcome to bobuCuisine! bobuCusine is an innovative brand that prides itself on producing stunningkitchenware products with affordable prices while providing an amazingcustomer experience. Moving out? New condo? New space? Let's us rock your kitchen with awesome newproducts! Like all of our products, your new Innovative Glass Storage Containers havetwo distinctive features; they're Cool & they're Quality! Fresher Food This 2-jar set of affordable capsule-shaped glass jars with airtight lids are perfect for taking foods to work, to school, to the lake or on vacation. Unlike plastic containers, the nonporous, clear-glass construction resists stains and odors, plus they're dishwasher, microwave, freezer and refrigerator safe. These first-class storage jars are both shatter resistant and spill-proof. 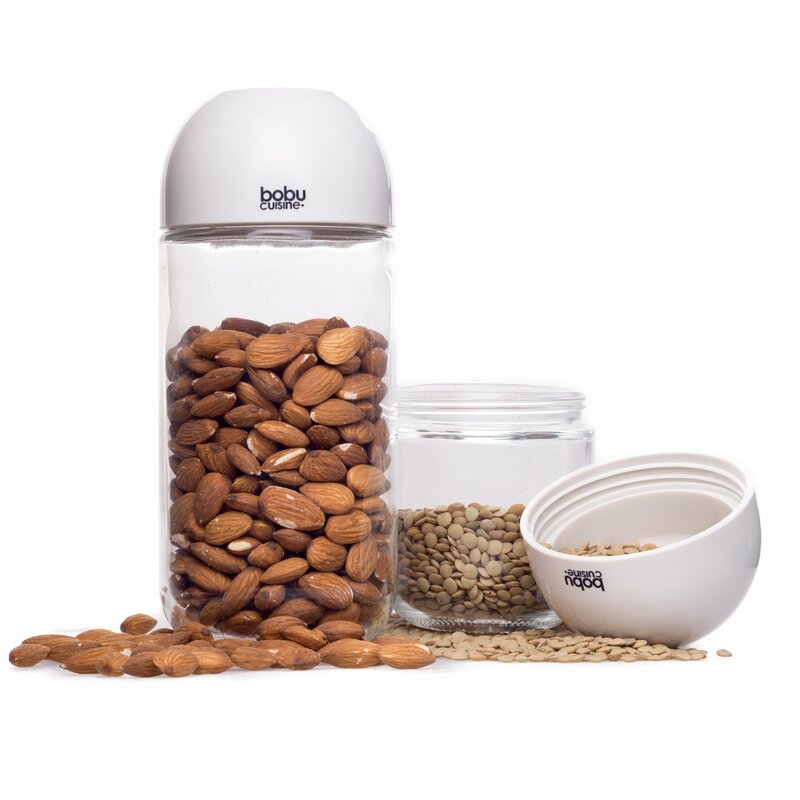 Minimal Space Required Your new storage jars are environmentally friendly and come in a set of two. Often people don't buy storage jars because they take up too much room or they just look clunky, but these jars have a cool, chic look. Their capsule shape ensures that they will take up little space. Use Them For Decorative Purposes Simply layer an inch of white beans, an inch of colorful pasta, an inch of kidney beans and inch of white rice for a lovely counter decoration. You can use any kind of dried fruits, vegetables, pasta or beans that you like. In addition, your dried foods will stay so fresh that you can go ahead and eat them even weeks later. A great gift idea A stylish package that truly makes a brilliant gift for anyone. Terrific value You will love your new glass jars! We guarantee all of our products, offer the best buying experience out there,and will continue to give you an abundance of care. Order today!